Why Won't You Grow?! : Nothing to say? Go back in time! Let's turn back the clock a bit more tonight, why don't we? Hey . . . don't blame me alone, all right? Everybody's doin' it! So, we've finished my first scrapbook and are moving onto my second one, which covers some of the year 1986--my freshman year of high school. Entering high school meant entering band, of course. It was never really a question of whether or not I would be in band. It was something that I had wanted to do since I was about ten. In my hometown we only had one high school and so everyone made it a large high school. Football was the dominant sport in south Georgia so everyone went to the football games on Friday nights. I didn't care so much about that growing up but I loved watching the band perform during halftime. As a young kid I would stand on the bleacher bench in front of me to see over people to watch the halftime show. I waved my arms around to "conduct" the band as they played. Truly, I was destined to be a band geek--or as we were derisively known during my HS years, "band fags." When my brother Muleskinner joined the band I had even more reason to pay attention. 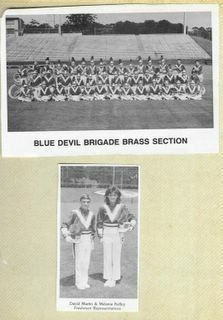 The Blue Devil Brigade, as the band was known, was a regimental style band with military-style uniforms (deep royal blue tops with white stripes; white pants for home games, royal blue pants for away games) and a pretty strict, traditional marching style. We definitely didn't do the very loose, easy-going types of marching that you might have seen in Drumline. Anyway, I started out in band in seventh grade as a trumpet player. My difficulty playing high notes eventually led to my switching to French horn. During the marching season, I played a similarly-toned instrument called a mellophone. I was always a bit shorter than everyone else, I guess, as you can see from these photos. But I took it all VERY seriously. Muleskinner has always been very musically talented (trombone in HS and college on a music scholarship; taught himself to play guitar, banjo, fiddle, recorder, probably something else I am forgetting). He was drum major his senior year--one of the most successful competition years in the band's history. 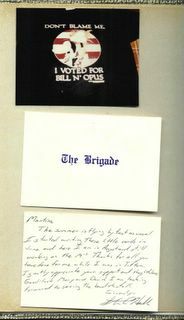 The Brigade won all of its competitions that it entered that year and performed in New York at the Macy's Thanksgiving Day Parade. I remembered all of this and wanted to have similar success during my years. Being a freshman in high school meant undergoing freshman initiation at band camp the summer of 1986. One thing that was NOT good about following my brother and my older sister MA in band (MA was a junior when I was a freshman. She played the alto sax.) was that I had already heard MANY stories about previous initiations. Trust me when I tell you that I was a bit obsessed and worried about it all. (like the school alma mater, which I kept--along with my first locker combination) carrying upperclassmen's luggage and instrument cases, and the like. 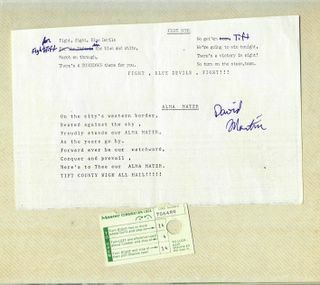 In the long run it was more challenging to learn the music and the corresponding marching maneuvers in the hot August summer on an asphalt parking lot. But that wasn't all that happened in 1986 of course. I was also deeply involved in my love of Berkeley Breathed's "Bloom County" comic strip. I owned all the books and I bought the catch-phrase tee shirt of the time . . .
. . . do you remember that? See, I was political even then. I bought that tee shirt after the 1984 election and probably took that picture to commemorate the shirt once I could no longer wear it. Anyway, music and politics . . . defined me then and defines me now, right? proudly stands our alma mater, as the years go by. Forward ever be our watchword, conquer and prevail. Here's to thee, our alma mater . . . Tift County High, all hail!" As always, this nostalgic journey is full of wonders. To think that the mellophone has "naming issues"! I wonder if it's a cousin to the mellotron (some kind of synthesizer?) used by the Moody Blues on their cheesy early albums. Muleskinner sounds like an interesting guy. Does he still play? As I read your post I just knew I would see a reference to Msquared the "P.E.C.E Loser" but to your credit it did not appear. Thanks for not throwing me under the bus even though the opportunity was clearly there. 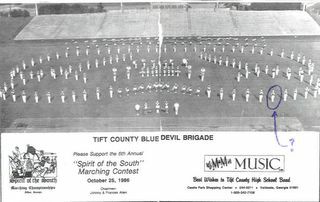 In a nostalgic post centered on the TCHS Blue Devil Brigade, the best outcome I could possibly hope for is to go unmentioned, so I guess it worked out to my benefit :-). BTW J. started band this year with my enthusiastic support. She is learning the flute. I have not yet enthralled her with any stories of my PECE exploits.